Some asked me to build a hot shot charger kit in an empty coil. I don't want to be the bearer of bad news but that is a pretty small space to confine the circuit into and the diode placed so close to the bulb and above it could spell doom for the diode. Hot air rises. It is like putting the diode in an oven. Most of the diode failures that people call me about are the result of putting the circuit in an air tight box. John ; that is the same as what I think . Ok, Ok, I will try to change it but the owner asked to built it in a coil. 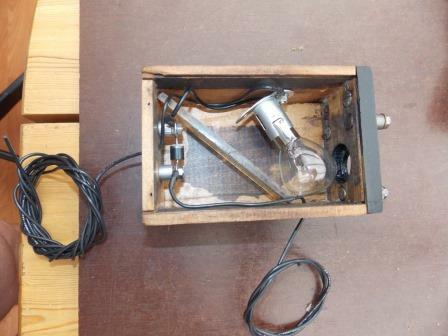 Originally, the idea was to build the lamp just under the "chimney" and the diode all the way down in the box. The lamp and socket assembly is just to high to fit where the diode is now. Maybe up side down for the light and the diode down in the box with a piece of glass between them. Hope you like this better. What is the purpose of the light bulb? If it is to act as a resistor, why not use a small resistor? Here is how I understood the working of the Hot-Spot battery charger. 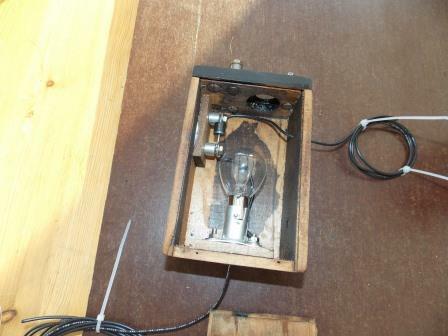 The unit is a electric serial circuit made of one diode and a light bulb. The diode has two purposes. First is to bloc the electric current willing to go from the battery to the magneto coil ring. Second is to make only the positive part of the AC current, produced by the magneto, go via the light bulb to the battery. The light bulb is in the circuit a regulating device. Light bulbs have a low resistance when they are cold, the resistance increase as the light gets brighter. As the magneto output lowers the resistance lowers and the resistance increase as the motor speeds up, thus tending to regulate the charging rate somewhat. If the light bulb were not in the circuit the battery would take all of the current from the magneto. Neat! I would suggest adding some air holes in the slide on cover. 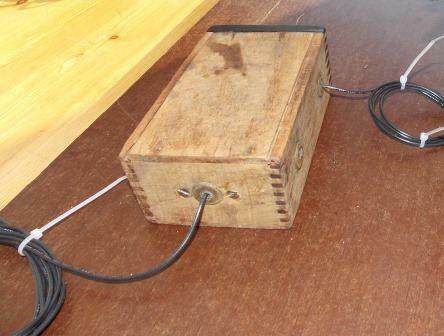 When I had a dizzy on my 1919 I mounted the charging circuit on a piece of wood the sat inside the empty coil box. Lots of room for heat. I have mine mounted under the floor boards on drivers side. What happens when the light bulb burns out? It stops charging the battery just like a blown fuse. Doug, just to make Mark's post a little clearer, it's a home made magneto battery charger. I run magneto chargers on 2 of my T's that are make by Bittner, one 6v and the other 12v, work well. Using a light bulb as a current limiting device is something I learned early in my career since I designed telephone equipment and the 48 VDC feed to your house from the phone company had light bulbs in series with your telephone line so that if your line became shorted the current draw from the central office battery would be limited and the lights glowing brightly immediately alerted your TELCO that your line was crossed up. Andre explained it well since the bulb works both ways. It limits the amount of power you can draw from the magneto so that you can still run coils OK in the normal manner but then if the diode fails it will fail shorted and in that event the bulb prevents the battery from feeding large current into the magneto winding and thus wrecking your magneto coil ring. Usually the bulb will burn out rather quickly if the diode shorts since the 12V bulb will then have both a 6V or 12V DC source AND a 28V AC source both powering it which will burn it out and charging will stop but nothing will be harmed. 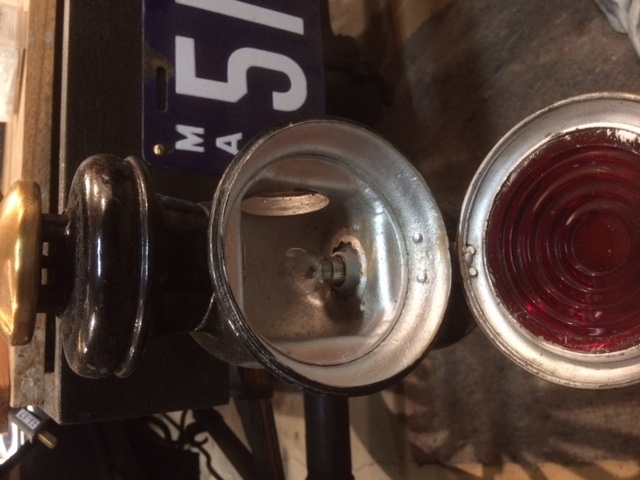 A quick look at the bulb will show that all is OK since it will be a bit dim at idle and much brighter at higher RPM. If the engine stops then so does the magneto and the diode is back biased so no need for any on/off switch either. The maximum current varies depending on whether you are using a 6V battery or 12V. You will get more charge current to a 6V battery but it will usually only be about 1.5 amps max and will reduce itself as the battery charges up since the voltage on the battery will go up too. The main reason you guys like it is because it is cheap ha ha. Just make sure you have the circuit well ventilated. Use a screen door on the box or toss the lid all together if that works for your installation. I noticed a bridge diode/rectifier will sit nicely between the magneto and generator connections on the bussbar type thing on the firewall. Is there any reason the lightbulb is needed as a current limiter other than to prevent the magneto being energized in the event of a diode failure? Out on a limb here, the hotter the bulb get the more resistance it has, so I am going to say it limits the amount of current going to the battery. Limiting the current going into the battery from the magneto is not something I'm worried about. It would be more like, limiting the current flowing into the magneto should the diode fail. I know nothing of the contents of the Bittner magneto chargers other than they work fine and are no bigger than a match box, no lightbulb.